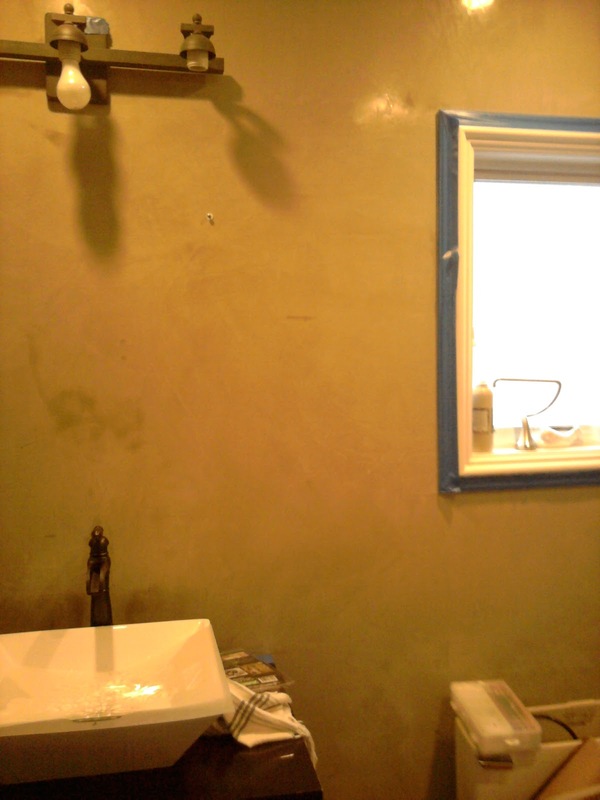 So what happens when you have a room, with walls that boast a very expensive, muli-layered finish (like venetian plaster)... and you can't stand it? 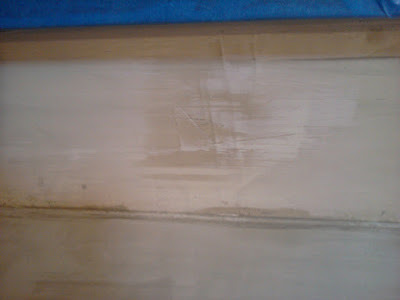 Perhaps the artisan who installed the finish made one or two boo boos that you thought you could live with. And you were wrong. 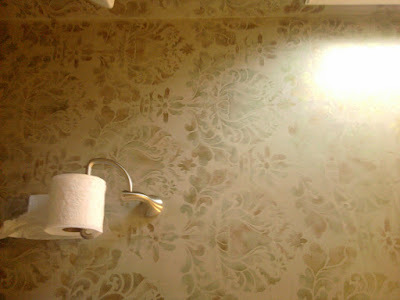 Perhaps this room is a small powder room on the first floor of a really busy, bustling home... and is hands-down the most often used room in the house. Over time, additional boo boos, nicks and bruises appeared. Before you paint over it and trash the whole thing... is there another alternative? YES! You say a little prayer and you call Divine Rooms! 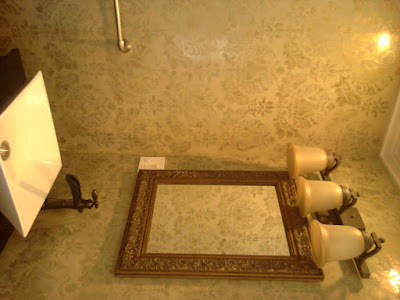 clients but they cleverly hid the spot with a mirror! This would bother me too. 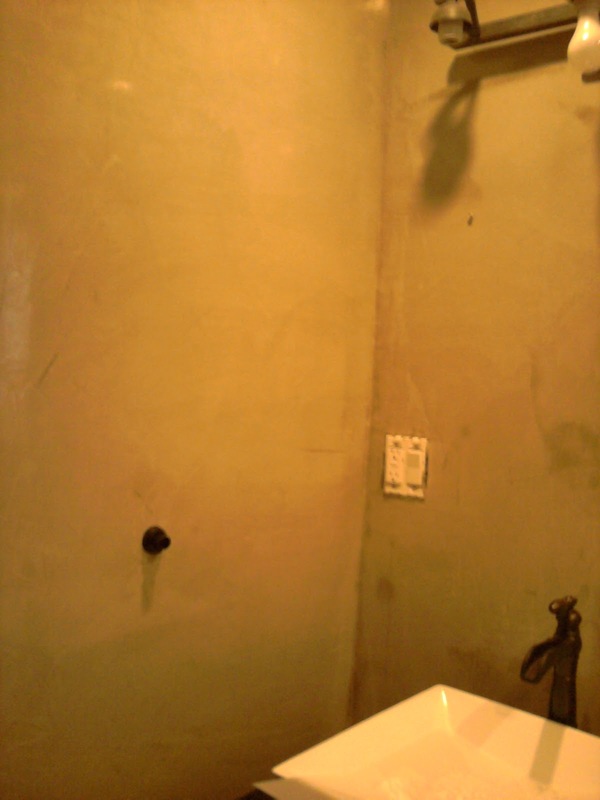 critical for proper installation of venetian plaster. I'm not really big on "inheriting problems" (contractor-speak for fixing, repairing or finishing another artisans work). But I felt up to the challenge. It was a perfect candidate for Divine Intervention. 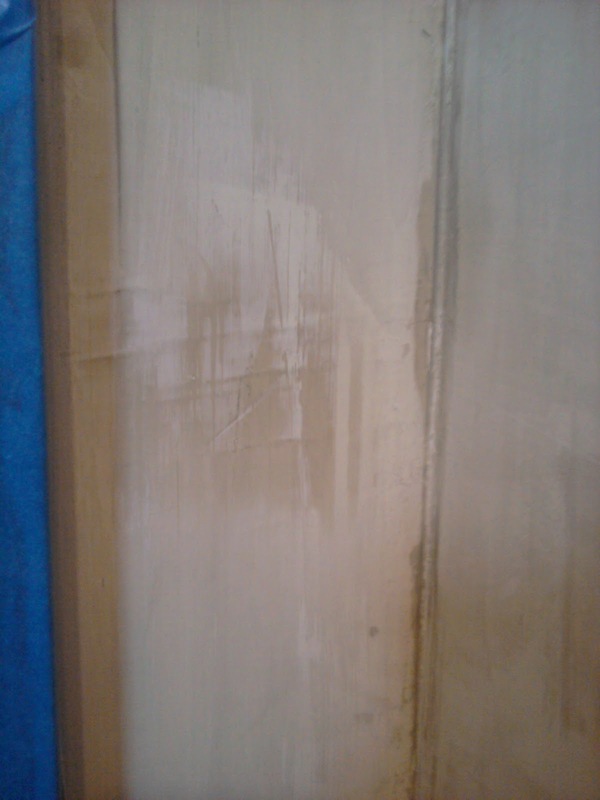 Venetian plaster cannot be repaired. I knew to "fix" this issue I would essentially need to do two things: 1.) distract the eye and 2.) camouflage the boo boos with "pattern." 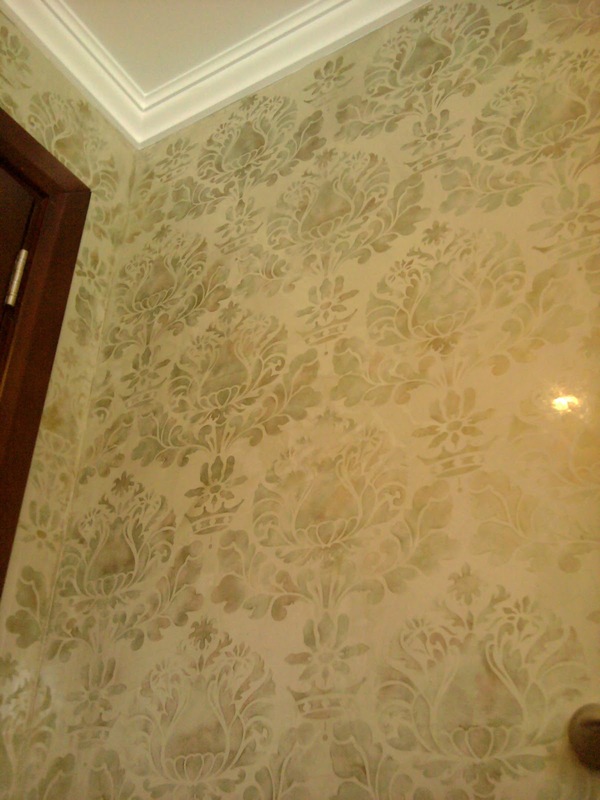 The perfect way to achieve this was to stencil a dense design and add more colors. Because the surface was a high gloss, waxed finish I didn't want to compete with the shine... so I selected mica powders as my medium, for their rich metallic lustre. Gloss and lustre compliment each other quite well when you are looking to enhance with richness and depth. and comprehensive Royal Design Studio collection. I chose to work with a darker green (for a tone-on-tone effect) and a complimentary reddish, coppery color for highlights. 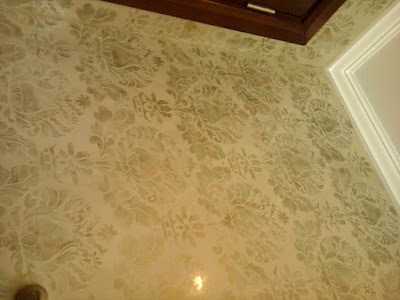 The green color was created by mixing a Modern Masters green metallic, gold mica powder and brown metallic powder together with a pinch of a very durable, clear medium that dries rock hard. The second color is a coppery reddish gold mica powder mixed with a touch of brown metallic powder, also with the clear medium. Applying anything over a waxed surface is not easy, as wax is intended to seal and thereby render the surface impervious. However, I tested my mixture on sample boards and was confident they could withstand wipe downs and heavy room traffic. 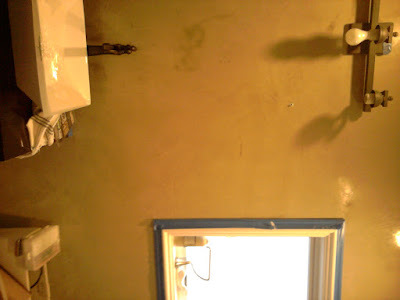 The mica mediums went on somewhat sheer so as not to obscure the venetian plaster underside. Oh! 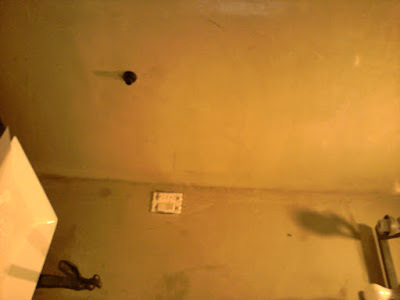 And before I began I washed down the walls. Very important if you intend on "rescuing a room." Always, always, always start with a clean surface. You wouldn't put make-up on a dirty face, would you? due to the high-gloss shine and glow of the materials. The wall with the most damage... viola! Sometimes it really isn't necessary to scrap a room and start from scratch. 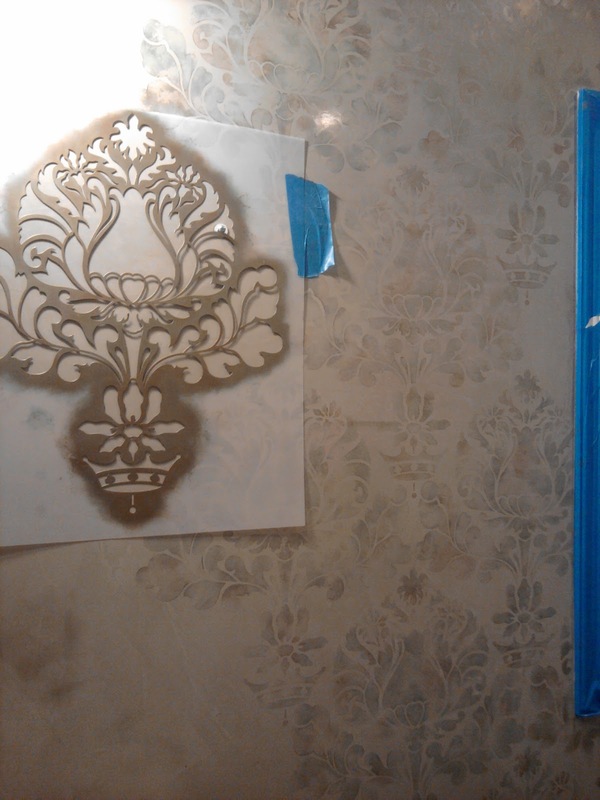 Sometimes all you need is a little faith, some patience and a pretty stencil! Brilliant move, Angela! 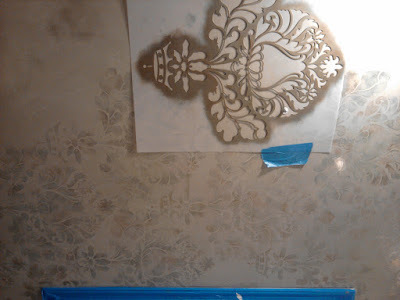 The blended metallic colors is one of my favorite stencil looks. 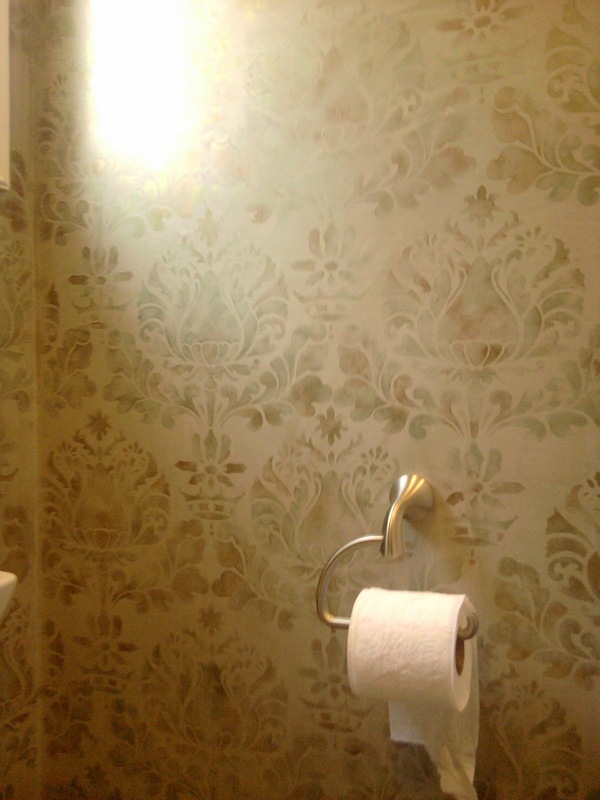 Thanks for making the Corsini Damask sing! Really beautiful, Angela. It looks like a completely different room. Well thought out use of product as well. Congrats! It looks just beautiful! Great save. I am really enjoying your blog (thanks, Melanie) and look forward to visiting again! 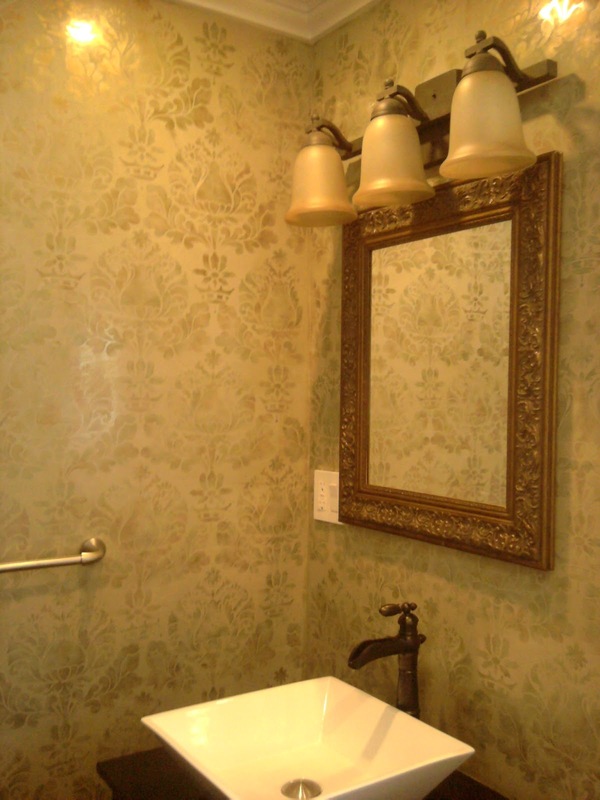 Loving that damask pattern as well as the finish you chose. Simply gorgeous!